UN Commission: Gazan testimonies show "face of human suffering"
Two days of testiminoes from Gazans over the Israeli war on the area "let the face of human suffering be seen," said head of the UN mission investigating Israel's war on Gaza Tuesday. His comments came after two days of live-to-air testimony from Gazans trapped in the besieged coastal region who suffered from Israel's devastating war on the area over December and January. The war resulted in the death of 1,475 Gazans. "As fellow human beings we would like to put on record how deeply moved we were by many of the accounts of profound suffering and grief we have heard in the last two days," Goldstone was quoted as saying. The commission will now move to Geneva, Switzerland, to collect statements from Israeli residents of border-towns near Gaza, as Israeli authorities refused to allow the commission collect the testimonies on Israeli soil. The delegation is expected to submit its report in August. Though it is a story he has told several times before, Wael Samouni does not mind retelling what he says Israeli soldiers did to his family during the Gaza war. To highlight his story, Samouni is prepared to present photos of the 27 members of his family who were killed in the war to a UN hearing set up to investigate allegations of human rights violations during the conflict. Al Jazeera's Sherine Tadros reports from the hearing in Gaza City. The UN fact-finding mission in Gaza City on Sunday started its first public hearing sessions to collect testimonials from victims of the Israeli war on the coastal region in December and January. Sessions were supposed to continue for two days, after which the collected testimonials will be sent to Geneva next week. The committee consists of four experts headed by South African Judge Richard Goldstone. They will meet war victims, eyewitnesses, and Gazan experts at the UN headquarters there. Other sessions will be held in Geneva on 6 and 7 July so specialists can study the consequences and impact of the Israeli military offensive, which left thousands of Palestinians dead and injured. The first testimony the committee heard was from the director of the World Health Organization in Gaza, who explained that the Strip's hospitals had suffered from severe shortage in equipment and medicines that rendered them unable to provide appropriate services for the large numbers of injuries, as well as other patients. He highlighted that continuous closure of the Gaza Strip crossing points impeded passage of medicines and medical equipment. He also told the committee that medical aid to the injured was difficult because Israeli forces repeatedly opened fire on medical staff. He also noted that 16 medics were killed during the offensive. The head of a UN probe into alleged war crimes by Israel and Palestinian fighters in Gaza said his investigation was unlikely to lead to prosecutions, the Associated Press reported on Tuesday. Justice Richard Goldstone told AP, "From a practical political point of view, I wish I could be optimistic," and cited the lack of a court with the jurisdiction to hear any cases that might result from his investigation and a major obstacle to prosecution. Israel's refusal to cooperate with the inquiry, he said, meant he was denied access to military sources as well as the Israelis subject to projectile attacks from the Gaza Strip. There were also problems in collecting information in Gaza, he said, explaining that Hamas-allied security forces accompanied his 15-member team during their five-day working visit to Gaza last week, potentially inhibiting the ability of witnesses to speak freely, according to AP. Goldstone, a Jewish South African who also prosecuted war criminals in Rwanda and the former Yugoslavia, said that he hopes his report, due in September, will result in action by governments and UN bodies. De facto Palestinian Prime Minister Ismail Haniyeh on Thursday night met with the head of a UN fact-finding mission investigating alleged Israeli war crimes in Gaza. The Hamas-affiliated leader met Justice Richard Goldstone, and the two discussed claims of Israeli aggression toward Gazans and allegations of war crimes in the latest assault on Gaza, in addition to the ongoing siege. Haniyeh's deputy, Ziyad Al-Thatha, and Dr Basem Na'im, Gaza's health minister, Justice Minister Faraj Al-Ghoul, Dr Muhammad Awad, secretary-general of the Ministers' Council, political advisor Dr Yousef Razqa and de facto spokesman Taher An-Nunu, accompanied Haniyeh in his meeting with Goldstone and his committee. Speaking at a news conference in Gaza on Thursday evening, Justice Goldstone said Israel was approached a number of times seeking its cooperation in the inquiry into the three-week attack on Gaza in December and January. "But we will not let that stop us from carrying out our mission," Goldstone said, ". the refusal of cooperation will not in any way decrease the weight of our investigation," adding that his team would also probe Israel's own allegations of war crimes committed by its opponents. Goldstone also said that while he could not disclose any information about the events his team is investigating during its weeklong visit to Gaza, the commission's report will be made public by the first week of September. He also said that Palestinians attitudes toward the probe had been "admirable" and their cooperation would be noted in the report. The Hamas de facto government in Gaza has complied with the investigation, in contrast to Israel. Goldstone, a Jewish South African judge and veteran of two international war crimes tribunals, was appointed by the United Nations Human Rights Council to lead the investigation into Israel's attack on Gaza, which left more than 1,400 Palestinians dead. Seventeen members of the team charged with leading the UN's fact-finding mission over alleged Israeli war crimes departed Gaza on Friday, according to a border spokesperson. A'del Zu'rub, spokesperson for the de facto government's crossings administration, confirmed that 14 left Gaza on Friday afternoon while three others left earlier in the morning. On Thursday night de facto Prime Minister Ismail Haniyeh met with the head of a UN fact-finding mission, Justice Richard Goldstone, who is investigating alleged Israeli war crimes in Gaza. In the meeting, Haniyeh accused Israel of a number of attacks against Palestinians, the commercial siege and claims that Israelis are preventing Palestinians from "all life sources," in addition to shelling residential buildings, "killing mothers and children in cold blood" and using prohibited weapons, violating international law, and torturing Palestinian detainees. He also said that Palestinians' attitudes toward the probe had been "admirable" and their cooperation would be noted in the report. The Hamas de facto government in Gaza has complied with the investigation, in contrast to Israel. The head of a UN fact-finding mission to Gaza said on Thursday that he would continue his investigation into alleged war crimes in spite of Israeli noncompliance. 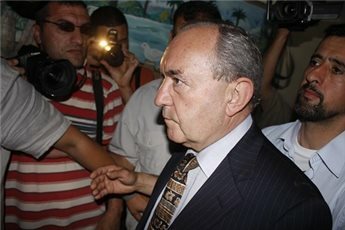 Speaking at a news conference in Gaza, Justice Richard Goldstone said Israel was approached a number of times seeking its cooperation in the inquiry into the three-week attack on Gaza in December and January. Israeli Defense Minister Ehud Barak came under pressure from UN Secretary-General Ban Ki-Moon to to cooperate with an international investigation into alleged violations of international law during the recent attack on Gaza. The UN Fact-Finding Mission, led by the renowned Justice Richard Goldstone, is in Gaza this week as part of the UN Human Rights Council's investigation of abuses committed during the three-week war that left more than 1,400 Palestinians dead. Ban raised the issue with Israeli Defense Minister Ehud Barak at a meeting yesterday in New York, the UN News Centre reported. "On the Gaza fact-finding mission, the Secretary-General renewed his call for cooperation from Israel," Ban's spokesperson, Michele Montas, told reporters. Barak told reporters that he rejected Ban's request. "We don't approve of the mandate the committee was given to investigate war crimes," Barak said he told Ban, according to the Jerusalem Post. He added, however, that Goldstone "is valued by the world, and by us as well." The Israeli blockade of Gaza, the long-stalled Arab-Israeli peace process, and Lebanon were also discussed in Ban's meeting with Barak, Montas said, according to the News Centre. Exclusive - An American group returning from Gaza says it will deliver a letter from Hamas to US President Barack Obama who is to give a landmark address to the Muslim world in the Egyptian capital on Thursday. Hamas official Ahmad Yousef confirmed that he wrote the letter, which the US women's antiwar group CODEPINK plans to deliver on Thursday. We welcome your visit to the Arab world and your initiative to break the problems between you and the Muslim world. One of the most important points causing tension between the United States and this part of the world is the failure to find a solution to the Israeli-Palestinian conflict. Unfortunately, you won't visit the Gaza Strip and listen to our point of view during your visit to the Middle East. The minister of foreign affairs and [envoy to the Middle East] Mr. George Mitchell also will not visit the Gaza Strip. We have received in the recent period many foreign delegations of different political backgrounds, including representatives from the US Congress and European parliamentarians, as well as the Chairman of the [UN] Fact-Finding Commission Mr. [Richard] Goldstone, in addition to many groups. The latest was CODEPINK from America. It is very important to visit the Gaza Strip and to witness the results of the Israeli war and these crimes that lasted 22 days. So many people were killed by Israel, which has the encouragement of the United States. Human Rights Watch documented that the use of the white phosphorus by Israel against United Nations schools and it was discovered that it is made in the US . they concluded by stating that Israel's use of white phosphorous is a war crime ... The question is for Americans: If you are the makers of such weapons and you are the owners of this weapon and you support Israel, how did Israel violate international law and used this weapon!? Before becoming the president of America you were a distinguished university professor in law, and your administration has indicated that it will work to strengthen the rule of law in the Arab and Islamic world. The International Court of Justice ruled in June 2004 that all of the West Bank, Gaza Strip and East Jerusalem belong to Palestinians and they are the ones who have the right to decide the future of their political existence and that the settlements in the occupied Palestinian territories are illegal. Fifteen judges and representatives of the highest international judicial authority did not add any conditions or dissent to these statements. We have also noted that the most important and international organizations; such as Amnesty International and Human Rights Watch, supported the right of Palestinian refugees to return to their homes and receive compensation. The human rights organizations noted also that the siege imposed by Israel on the Gaza Strip is a punishment that violates international law. We are, in the Hamas government, committed to a just solution to the conflict in keeping with international law and the rulings of the International Court of Justice and the [UN] General Assembly and human rights organizations. We are ready to continue with all parties on the basis of mutual respect, without any prior requirements or conditions. Again, we would welcome President Obama to the Gaza Strip, in order to see the damage done. Such a visit will put the United States in a higher position in the view of the entire world in order to solve the conflict. At 9am on Thursday the delegation of journalists, social workers, professors and activists will carry the letter to the US Embassy in Cairo along with a petition signed by more than 10,000 Americans asking Obama to go to Gaza to witness the impact of the recent Israeli invasion there and its ongoing blockade. "Obama should go to Gaza and see the devastation for himself, or send envoy George Mitchell," said Medea Benjamin in a statement. Benjamin is co-founder of CODEPINK, which led the group through Gaza. "There will be no significant improvement in relations between the United States and the Arab world until the U.S. begins to deal directly with Hamas and shows its commitment to the rights of both Palestinians and Israelis." Egypt allowed the 66-person delegation through the Rafah crossing into Gaza on 30 May. The group brought toys, school supplies and playground building supplies, and built three small playgrounds there. The group said in a statement that it was "shocked by the brutality of the Israeli invasion that killed more than 1,400, displaced more than 50,000 people and destroyed approximately 4,000 homes." They were also appalled by the effects of the 21-month siege that has "virtually sealed the borders and constitutes a form of collective punishment, which is illegal under international law." Approached by Ma'an, US officials in Jerusalem have not yet responded to this report. The US officially considers Hamas a "terrorist" organization and thereby refuses to deal directly with it. Palestinian de facto government officials in Gaza handed over documents, photos, and other materials to a UN fact-finding commission in cooperation with an investigation into allegations of war crimes on Monday. The Hamas officials met with the UN team, headed by South African Justice Richard Goldstone, on Monday night at the end of the first day of the team's field visit to Gaza. The officials said the materials were evidence of Israeli violations of the laws of war during the attack on Gaza in December and January, which left more than 1,400 Palestinians dead. Health Minister Bassem Na'im, Justice Minister Muhammad Faraj Al-Ghoul, and Foreign Ministry political advisor Ahmad Yousef, and government spokesman Taher An-Nunu held talks with Goldstone's team in the Health Ministry building in Gaza City. Al-Ghoul said in a press conference after the meeting, "The government provided and will provide more documents and papers that will show the crimes committed by the Israeli occupation against Gazans." He also said that the Palestinian officials explained the types of weaponry used by Israel during the war. On Tuesday Goldstone's commission continued its work. The team refuses to release the details of its schedule. The local organizations hosting the team, such as UNRWA, have also refused to disclose this information. Reporters and photographers are not allowed to travel with the group. Goldstone and his team of 15 international legal experts are staying in the Ad-Dira Hotel in Gaza. The group left the hotel at eight in the morning and was not expected to return until late at night. What is known is that the team planned to meet with more government officials and also visit the Samuni family, which lost 29 of its members to the Israeli bombardment in January. Police kept journalists from covering the visit. Speaking at Monday night's press conference Hamas political advisor Ahmad Yousef also said that the government will work seriously to provide the commission with what they need to do their work successfully. An-Nunu said that the UN team will visit areas devastated during the Israeli invasion, including Jabaliya Refugee Camp, the town of Beit Lahiya, and the Zaytoun neighborhood of Gaza City. The Hamas government's response was in stark contrast to the Israeli government's ongoing refusal to cooperate with Goldstone's investigation. While the Goldstone's mandate calls on him to investigate violations committed by all parties, including Palestinian fighters and the Hamas-led government, it is unclear if authorities in Gaza would also cooperate with that aspect of the inquiry. Goldstone's team leaves Gaza on Friday and is due to submit its report to the UN Human Rights Council in August. A UN fact-finding commission into alleged violations of international law committed during Israel's recent offensive arrived in Gaza via Egypt's Rafah crossing on Monday morning. Israel has announced it will refuse to cooperate with South African jurist Richard Goldstone's investigation, while Hamas, the ruling power in Gaza, says it welcomes the team, which was tapped by the UN's Human Rights Council. In a statement issued on Monday Hamas said it praised all efforts by human rights committees and organizations that work to reveal the truth about the Gaza war. Hamas Spokesperson Fawzi Barhoum welcomed Goldstone's team, saying, "We are ready to help these committees and encourage them to unveil the truth and bring out all the hidden details of what took place during the war, hoping to show the entire world the truth." Barhoum added in a statement sent to Ma'an: "I consider that the Israeli rejection of dealing with such committees proves that they committed crimes in Gaza and they want [the truth] to be hidden." Hamas official Ghazi Hammad and local UN officials met the investigators at the crossing. The inquiry is led by a Jewish South African judge, Richard Goldstone, former Chief Prosecutor of the International Criminal Tribunals for the former Yugoslavia and Rwanda. The team also includes Christine Chinkin, professor of international law at the London School of Economics; Hina Jilani, a human rights advocate from Pakistan; and Desmond Travers, a former officer in the Irish Armed Forces with expertise on international criminal investigations. According to a statement issued by the UN in Geneva, the team's initial field visits will take place over the coming five days, with future visits in the works. The commission was established with a mandate to "investigate all violations of International Human Rights Law and International Humanitarian Law that might have been committed at any time in the context of the military operations that were conducted in Gaza during the period from 27 December 2008 and 18 January 2009, whether before, during or after." "In accordance with its mandate," the UN statement said, "the Mission will focus on relevant violations by all parties in the entire occupied Palestinian territory, including Gaza and the West Bank, and Israel." More than 1,400 Palestinians, including hundreds of civilians, were killed during the three-week assault in December and January. Israel maintains that its own internal investigations are sufficient inquiry into war crimes allegations, but human rights organizations reject these probes as a cover-up. The United Nations' team of experts tasked with investigating alleged Israeli war crimes will depart for Gaza this weekend, officials said Friday. The group is looking into claims Israel committed flagrant violations of the laws of war during its 22-day assault on the Gaza Strip that began in late December. UN spokesperson Rolando Gomaz said the initiative, led by Jewish-South African prosecutor Richard Goldstone, will leave for Gaza early next week, although Israel is not expected to cooperate in the undertaking. At a news conference in Geneva, Gomez said the Goldstone team has repeatedly asked Israel to cooperate with the mission being led by the UN Human Rights Council, but the country has declined. "This committee has been instructed to find Israel guilty no matter what and there is no point in cooperating with such a masquerade," said government spokesman Yigal Palmor, according to the Israeli newspaper Haaretz. Meanwhile on Thursday, Amnesty International alleged that Israel repeatedly violated the laws of war during its assault on Gaza last winter. "Israeli forces repeatedly breached the laws of war, including by carrying out direct attacks on civilians and civilian buildings and attacks targeting Palestinian militants that caused a disproportionate toll among civilians," the group said in its annual report on the state of human rights worldwide. A United Nations team tasked with investigating allegations of war crimes plans to visit the Gaza Strip and Israel in early June, even though Israel has not formally approved the visit. South African jurist Richard Goldstone, who is heading the four-member commission, told reporters in Geneva that Israel has not formally responded to a request to enter the country. However, he said the four were prepared to enter Gaza through Egypt's Rafah border crossing as a "second choice," according to Reuters. "One decision we have taken is we will have a number of days of public hearings. If we can in the region, so much the better, and if necessary we will have them in Geneva," Goldstone told reporters after the team held talks with UN Secretary-General Ban Ki-Moon, according to Reuters. Israel killed nearly 1,500 Palestinians during its three week onslaught on Gaza last December and January, including some 900 of civilians. Rights groups say that there is significant evidence that Israel violated international humanitarian law in failing to discriminate between combatants and civilians, among other offenses. The inquiry team appointed by the UN Human Rights Council is to report back by 4 August. It will also to probe allegations that Palestinian fighters violated the laws of war by targeting civilians with homemade projectiles. Reuters reported Goldstone said he had made a direct approach to Israeli Prime Minister Benjamin Netanyahu to be able to enter Israel but had received no response. However, he said he was aware of reports last month that Israel does not plan to cooperate. Hamas said in April it would accept a UN investigation into Israel's actions in Gaza. "It would have been our wish to start there, to visit southern Israel and Sderot, to go through Gaza through the front door, to go into the West Bank which is also included in our mission," he said, according to the news agency.